"They fought for their country. Now, They're fighting for their friends." Starting off in the jungles of Vietnam, we are introduced to a “band of brothers” consisting of Bill Eckert (Stone), Garrett (LHJ), Ray (Graham), Joe (Redfield), and Woody (Wood). After some shooting and explosions confirming that these guys are an elite fighting unit, the text on the screen then informs us: ATLANTA NOW. It seems the town of South Point, Georgia is now a depressing slum. Rival gangs control the town and keep it in a grip of fear. They shake down what local businesses are left for protection money. The gangs The Turks and The Scorpions are bad, but for pure evil, no one beats Roy Boy Jagger and The Rollers. (It has yet to be verified if they opened for John Cafferty and the Beaver Brown Band on one of their tours). When, in the midst of an armed robbery, said Rollers kill Joe, Bill rallies the old unit back together to clean up the streets of South Point. They use their military techniques and camaraderie to not just expel the gangs, but bring hope back to the community. By that, they obviously mean teaching elderly men and confused waitresses martial arts. Will these heroes defeat Roy Boy and get revenge for their fallen comrade? The Annihilators (great title) is pure 80’s fun from start to finish. It is enjoyable the whole time - this is the type of movie that’s best experienced with a group of friends who are in a good mood. (If you’re not, it will put you in one). The movie seems to be attempting a marriage of two successful action movie sub-genres: the Vietnam shoot-em-up and the urban revenge thriller. The results are humorous. The whole “reunite the old Vietnam war crew to get revenge” was seen in the also-hilarious Kill Squad (1982). What is it about this plot that allows for such laughs? The movie tends toward optimism - only in the 80’s could the message of “believe in your dreams” be tied so closely with flamethrowers and shooting people in the face without a hint of irony. You gotta love it. Gerrit Graham plays the comic relief jokester, LHJ, in a pretty early role, gets the best Karate moves in the film, along with a memorable neck-snap. Naturally, the heroes are fighting a panoply of middle-aged punks. In the 80’s, it seemed to become a ne’er-do-well later in life was more accepted. The whole “store owners fighting back” angle was a lot of fun and had a Bums (1993) feel. Paul Koslo as Roy Boy is very impressive. He’s a sort of demented Patrick Swayze that goes far off the rails. His performance is inspired and worth seeing. On the technical side, the opening credits all have a gunshot noise that gets you into the spirit quickly, the music is great in its own way, and the newspaper reads “Vigilantes In South Point”. The box art is very cool, if not entirely representative of the movie itself. There’s no “Annihilator” in the movie that wears a Jason mask, and they mistakenly call the antagonist Roy Boy Jessup. Apparently both the artist and the writer were allowed to just make stuff up. Keep in mind this is a New World tape (Corman for those who don’t know). Overwhelming silliness ensues - in the best possible way - when you put on The Annihilators. Recommended. Thanks! That is a good point, Ed. Roger Corman should make a few new war flicks! I had this flick on BETA back in the day. Great 80's fun with a solid cast. Tip-top review as per usual. dude! i had actually gotten this in the mail the other day and is on my list of upcoming reviews! i thought i was the only one who remembered this! lol. great review dude! this shoulda been the cover for The Expendables. Video Vacuum: Thanks! Totally agree. It was a ton of 80s fun. RobotGEEK: Very cool! Looking forward to your take on it. Definitely agree about the poster. Awesome! I live in Atlanta and South Point is pretty obviously the actual town of East Point, which could certainly use a crew of annihilators. I'm picking up a little A-Team vibe as well, yes? No? @videovacuum - I miss the BETAs. It does have an A-Team vibe! Also: Why didn't Mr. T make some action movies? If your town is crime-free, you have The Annihilators to thank! I don't know what Mr. T's deal is. And South/East Point is way far from crime free. 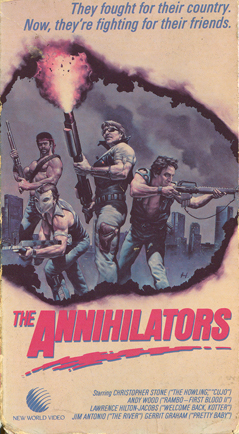 Then again, the Annihilators were apparently there in 85, so maybe it's just time for a sequel. Haha, They should make a sequel! Lawrence Hilton-Jacobs needs a good role right now. Classic stuff. Ripped this to DVD back in 06 from my VHS copy!! This looks great, and it's a Corman to boot. I'll definitely keep an eye out for this one! Man, this looks great! I will definitely check it out. Force_Field: Nice! It is a classic! Explosive Action: It is definitely a blast! Got to love a good "Mercenaries clean up the streets story". Hoaks2: Cool! Looking forward to your opinion! How did this one escape my memory? Are you sure this isn't Fast Getaway 4? Haha, Fast Getaway. Forgot about those Corey Haim flicks! I have not done any LHJ in a long time, but m,aybe I need to, especially with a movie like this that you list as being this much fun. Great stuff. Thanks once again! Would be interested in your opinion on this. LHJ rules. LHJ, LDP, and JPL (John Phillip Law) should have made an action movie together. You're missing the overall message and spirit of camaraderie that the Annihilators represent! This film is simply superb and I was amused to see 'Roy Boy' in an early episode of The A-Team on Netflix playing a crooked cop helping wage underground, bare-knuckled fighting between prisoners in a corrupt jail. That plot right there is delicious enough! Awesome! Roy Boy rocked. Will have to check out that A-Team Episode! Love that plot. Hilarious that so many like this film. I worked on it and indeed much of it was shot in South Point. Empty buildings that the art department converted into store fronts and a dinner and such. Crime you say? Yep, we actually had the grounding cable stolen off of our generator during the day time ... WHILE IT WAS RUNNING! How the perpetrator didn't get fried is a miracle. Other fun facts - The "Jungle" sequences were shot in the swamp around Charlie Brown airport (good times). - The bulk of this film was shot during the day ... at the same time "Invasion USA" (a Chuck Norris vehicle) was being filmed at night in ATL. A lot of our stunt crew were pulling 2 shifts, working on that film as well. Could be why one got hurt. There is a scene in which the baddy falls off a 5 story building onto a car he had set on fire earlier. The stunt guy made some sort of mis-calculation and hit the bag wrong. They had to cart him off to the ER. Back injury that I believe he recovered from. - There is a flashback scene to Vietnam where one of the guys is playing with a booby trap. Big log full of bamboo spikes that is supposed to swing down and impale you. He does some quick calculations, puts a canteen on his head, then triggers the trap which swings down and impales the canteen into a tree. It worked in the long shot with the stunt guy ... but when they went to do the close-up they switched to a main character and a plastic canteen. When they shoved the pointy log at it, it didn't pierce the plastic. Instead it deflected downward into the guys forehead! Talk about an ugly moment on the set. They had to do some sort of reconstructed micro surgery but 6 weeks later he was back to shoot the rest of his scenes. Thank you for sharing your memories and experiences. We love first-hand insights in how the movies are made. We appreciate you taking the time to write in. We agree the 80s were an awesome time!